This is part eight of eight posts about your chakras. We started with your root chakra and have moved all the way up to your crown chakra! 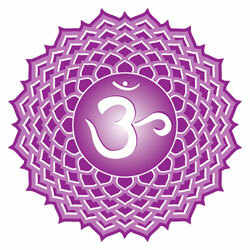 The crown chakra, or sahasrara, is the seventh chakra and is located at the top of your head. The gift of the chakra is experiencing unit and selfless realization that everything is connected at a fundamental level. The energy of this chakra allows us to experience mystical oneness with everyone and everything in nature. There is no intellectual knowing here, but there is serenity, joy and deep peace about like. You have a sense of knowing that there is a deeper meaning of life and that there is an order that underlies all of existence. We use the seventh chakra as a tool to communicate with our spiritual nature. If your crown chakra is blocked, you may feel indecisive; worry that your life is meaningless and suffer from depression. Also, this chakra is negatively affected when we get too attached to material things and lose the ability to let go. To start healing, meditate and do more of those things that make you feel peaceful. Learn to think of yourself as a part of the universe (as opposed to, for example, being a professional belonging to a company). Or you can hit the mat! Try a headstand, or salamba, sirhasana. Don’t be afraid to use the wall for support, I usually do! From knelling on all fours on your mat, come to your forearms in the middle of the mat. Clasps your hands together and lock your fingers. Rest the crown of your head on the mat in the space between your forearms, supported by your clasped hands. Slowly raised your knees off the floor by moving your toes closer to your head. Lift your trunk and bend your knees. Straighten your knees and balance. The crown chakra represents pure cosmic energy. By practicing crown chakra yoga poses, you awaken to this level of experience and will experience periods of bliss, divine connection, unity, peace, beauty, and much more. Hola! I’ve been following your blog for a long time now and finally got the courage to go ahead and give you a shout out from Porter Tx!